Terve to all people here! Next week I'm going to Finland and I would like to learn some finnish phrases. P.S: Am I the only one who thinks that the language sounds awesome and very ancient? 2) Let's get drunk together! These are the phrases that I would like to learn. I didn't go to google translate website, 'because the translation there is rubbish. Kiitos to everyone in advance for your help. Bobalosus wrote: Terve to all people here! Next week I'm going to Finland and I would like to learn some finnish phrases. P.S: Am I the only one who thinks that the language sounds awesome and very ancient? No, you're probably not the only one -- every now and then someone says something like that here in the Finnish subforum. I'll do two versions, a standard written language one and a colloquial spoken language one. 1) Pidän oikein paljon Suomesta ja suomen kielestä! 2) Juokaamme itsemme humalaan yhdessä! 3) Sinäpä olet mitä ihanin! 1) Tykkään tosi paljon Suomesta ja suomen kielestä! 2) Juodaan itsemme humalaan yhdessä! / Vedetään kännit yhdessä! 3) Säpä oot mitä ihanin! Bobalosus wrote: Varislintu! Kiitos paljon for your help! I really appreciate it! You have written that there is a colloquial spoken language, that can be used too. So what kind of language should I speak with people, that I don't really know? You can choose either, there's not a "politeness" difference between them per se, even though spoken language is of course less formal. It's just that a native speaker would usually not speak standard written language, only write it. But as a non-native, everyone will understand why you would speak the written language, so it's quite okay to do so. Heh, yeah, I can see how it's daunting. But maybe if you think of it as words with built-in prepositions, the kind that English has as well (in, on, from, to, etc), it won't seem as impossible to tackle. Don't go hugging people you don't know. Just don't. Actually, don't even touch people you don't know. If you're friends with someone, then you may touch them on arms / back, but it depends on the person. Some are more ok with touching, some are very sensitive about it. When you're in Finland, see what other people are doing and follow their example. 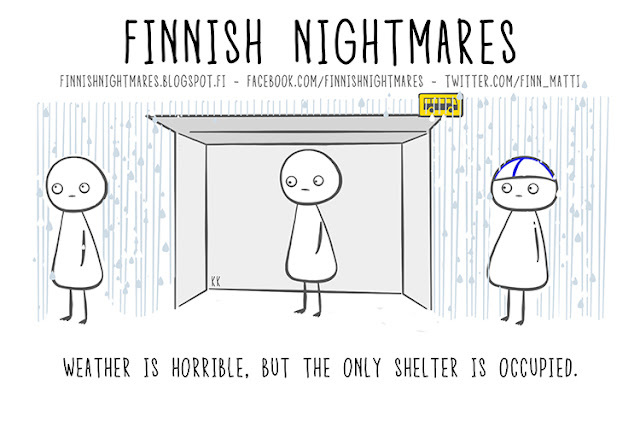 Finnish Nightmares is a lovely comic! You can find it on facebook, too. It does exaggerate a bit, but often it's quite spot on. Naava wrote: Don't go hugging people you don't know. Just don't. Yes, I would say exactly this as well. I'd say wait and see what he does. If he's ready to welcome you arms wide open, you may hug back. If he's just standing there and says "hi", do not go embracing him. If you want to be polite and show friendliness, you can say something like "it's so cool to be here at last, thanks for the invitation!" - answer, preferrably with more than plain "ok"
- ask his opinion, eg. "do you want to go to X or..?" - and be honest: if he asks "do you want to --" and you're cold or hungry or just not interested, tell him. I'm not from Helsinki and I'm not a man, but I think it applies there too. You don't have to accept anything you don't want to, except maybe something that is given to you as a gift or if it's food. Though usually people expect an excuse why you don't want something, as in "no, tbh it doesn't really sound so cool to me". But I mean, it's fine to say you don't want to do or get something, even if you don't know each other super well. I think these are quite universal, after all, but these are ways of showing you're friendly without touching anyone.